See Anne perform and experience her beautiful harp music within the following media pages. 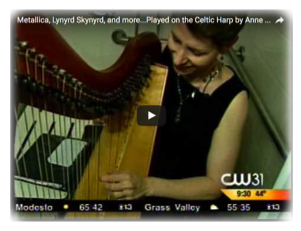 Anne Roos' harp music videos provide a glimpse of Anne at live performances. Get a souvenir of these video performances—Anne’s recordings are available for purchase as downloads and physical CDs. You can even share her music with your friends and loved ones with animated e-cards that contain her music! Then browse through her photos and select your favorites for your fliers and articles. These pages are meant to be interactive: Send your photos and videos to Anne for posting to in this section. 1. Links for Sampling and Buying Anne’s Recordings —Did you have the great fortune of seeing Anne Roos play her harp in person, and are you looking for a souvenir of the performance? Do you need to hear some sample tracks of Anne’s music before hiring her to play for your event? Are you deciding which songs to ask Anne to play at your wedding? Or are you simply looking for a distinctive, uncommon gift for the person in your life that loves quality music? Delve into Anne’s 50+ recorded tracks at this web page. Purchase autographed CDs directly from the artist by calling 530-541-2575. You can also buy CDs directly from Anne at her Facebook Merchandise Shop. 2. Videos of Anne’s Performances—Watch Anne perform without the time-consuming task of searching YouTube. Anne’s favorite videos are posted on this page, and she’s always looking for more. Attend one of her concerts, shoot some great footage, and send it to Anne for consideration. Visit this page to find out how you’ll be rewarded if your video is posted. 3. Links to Whimsical Animated E-Cards—Anne is honored that her music is featured in several beautifully animated online greeting cards. Click on the links and send them to deserving friends and loved ones. It’s a cool way to share Anne’s music! E-cards are a small part of the multi-media projects that interest Anne—She’d love to license her music for video games, commercials, TV and motion picture soundtracks. Contact Anne for more info. 4. Anne’s Extensive Photo Gallery—With more than 30 years of performance experience, Anne’s photo archives are enormous. She divided the best of her photos into three categories—Press Photos, Performance Photos, and Fun Photos with Friends—to display in her online photo gallery. Get into the action: Capture a great photo of Anne Roos and her harp and submit it. If Anne posts your photos here on her website, you’ll receive a special gift (read details at her photo gallery page). Of course, you’ll also receive photo credit. Reporters: If you don’t see what you a looking for, contact Anne and she’ll search her extensive photo vault to help you find the perfect image for your article. Bookmark and check back to Anne’s Media Pages to download newly added photos, videos, and recordings!